Mobile analytics measures and analyzes the data that is generated by mobile properties and platforms which include mobile applications and mobile sites. The global mobile analytics market is expected to have a CAGR of about 24% during the forecast period 2016-2023. Increase in the usage of mobile apps, mobile advertising and increasing demand for real time analytics are the factors responsible for the growth of global mobile analytics market. Factors such as increased adoption of cloud based mobile analytics and increasing convergence of mobile, web and social analytics are also expected to drive the market growth during the forecast period. 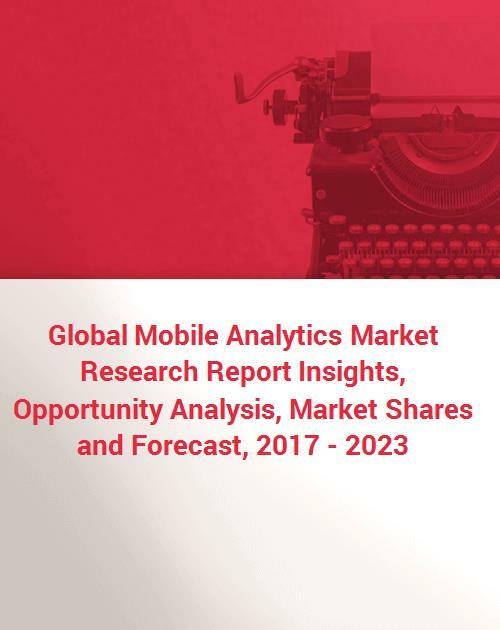 However, concerns related to privacy and security and as well as complex technology and scattered data are the factors restraining the growth of the global mobile analytics market during the forecast period. Also, lack of awareness among consumers is acting as a major challenge for the global mobile analytics market during the forecast period. Geographically, North America accounted for the highest revenue share in 2016 due to increased usage of smart phone in the region. According to Pew Internet Research Organization (pewinternet.org) in 2014, there are around 59% America uses smart phone that rose to 77% in 2016. Moreover, Asia Pacific is expected to be the fastest growing region for mobile analytics during the forecast period. The region is expected to witness the highest growth due to increasing penetration of tablets and smart phones across countries like India, China and Indonesia. According to International Telecommunication Union (ITU), the number of smart phone users in China is estimated to reach up to 675 million in 2019 therefore growing the mobile analytics market in Asia Pacific during the forecast period. The growth in global mobile analytics market is also influenced by the presence of major players such as Adobe Systems (U.S.), Amazon Web Services (U.S.), Google (U.S.), Microsoft Corporation (U.S.), IBM (U.S.), Webtrends (U.S.), Upsight (U.S.) etc. Product launches, Mergers & acquisitions etc. are some crucial strategies adopted by the major players to gain competitive advantage. Global mobile analytics market covers a segmentation analysis of type, deployment models and vertical. Report further covers sub segments of type which include application performance analytics, in app behavioral analytics and mobile advertisement and Marketing analytics. Deployment Models is segmented into cloud and on premise. Furthermore, vertical is segmented into Banking, Financial Service and Insurance (BFSI), gaming, government, healthcare and life sciences, manufacturing, media and entertainment, retail and e- commerce, telecommunication and IT, transportation and logistics and travel and hospitality.